Alexandra Gould’s portrait joined 119 others at the Ruth Borchard Self Portrait Competition 2017. The Prize is now one of the most significant competitions in the artist’s calendar. 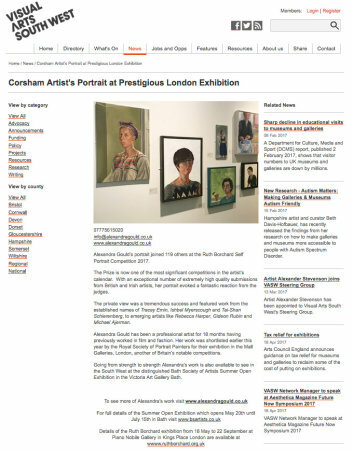 With an exceptional number of extremely high quality submissions from British and Irish artists, the private view was a tremendous success and featured work from the established names of Tracey Emin, Ishbel Myerscough and Tai-Shan Schierenberg to emerging artists like Rebecca Harper, Gideon Rubin and Michael Ajerman. Alexandra Gould has been a professional artist for 18 months having previously worked in film and fashion. Her work was shortlisted earlier this year by the Royal Society of Portrait Painters for their exhibition in the Mall Galleries, London, another of Britain’s notable competitions. Going from strength to strength Alexandra’s work is also available to see in the South West at the distinguished Bath Society of Artists Summer Open Exhibition in the Victoria Art Gallery Bath.